Analyst views of the Internet of Things (IoT) vary drastically depending on how one defines the topic. As a result, there is the potential for much hyping. Analyst views of the Internet of Things (IoT) vary drastically depending on how one defines the topic. As a result, there is the potential for much hyping. 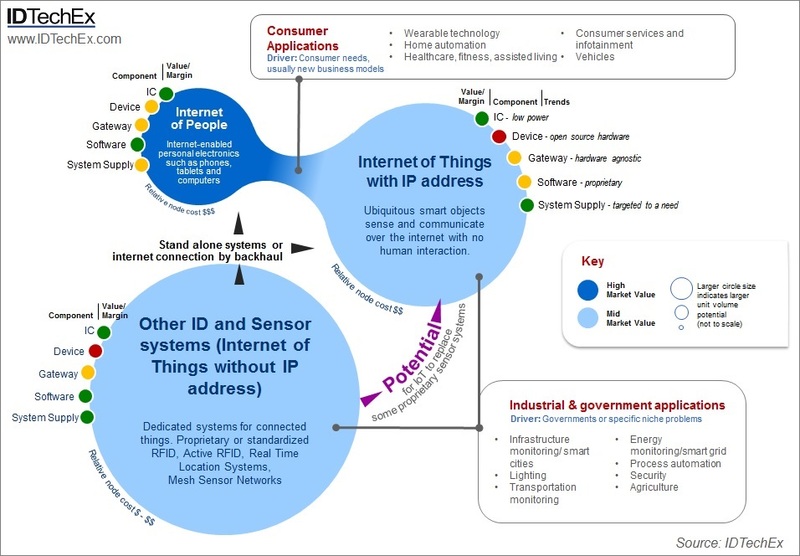 Having thoroughly researched the topic, IDTechEx has mapped the IoT ecosystem as shown in the diagram below, where IoT centers on things collaborating with things without human intervention at the time. These things have internet protocol (IP) addresses, microcontrollers for local data processing and they sense. The Internet of People (IoP) is very different: a renaming of the world of smart phones and other internet-enabled personal electronics, it is maturing but adding wearable personal devices and many new human interfaces. Thirdly, there are many other dedicated identification and sensor systems for things but these do not have IP addresses at the item level, using other data standards or proprietary systems. These are not truly IoT as a result but some include them as part of the topic which leads to widely varying forecasts. Fig. Ecosystem of the Internet of Things. View the full sized graphic here. IDTechEx see two main application sets emerging for IoT - consumer applications, driven by the proliferation of smart phones and tablets which can connect to objects, including wearable technology, home automation, healthcare and fitness, vehicles and infotainment; and industrial and government applications, such as infrastructure monitoring, lighting, transportation and process automation. Industrial and government IoT - is anything new? The latter will succeed where IoT solves problems, and this, based on history, can be more challenging that at first glance. Businesses seek a clear return on investment before investing, and the adoption of non IP based sensor systems has been slower than expected in many respects. Many systems are used in closed loop scenarios where few nodes are used and there is more value in the complete solution supply. Often there is some degree of supplier lock-in - using systems dedicated for a particular application (which tends to perform better than generic systems) which also helps to prevent the hardware from becoming commoditized. With reluctance from incumbent suppliers, some of that may transition to IoT IP based devices in time, where hardware will be commoditized. Then there are other applications such as very low cost, high volume passive RFID tagging 3 billion items of clothing in 2014, where retailers can see sales increase by 3 to 20% by reducing apparel stock-outs. The low price points and rapid volume adoption of passive RFID will see the unit volume of non IP addressed objects being the higher volume opportunity, compared to IoT devices with an IP address which will be more expensive. The wild card here is Government funded projects. Historically and unexpectedly, governments have made huge investments in wireless identification and sensor systems and they do not seek rapid ROI but do things for improved security, efficiency etc. Examples are governments mandating smart meters - the world's largest mesh network using ZigBee, without which ZigBee would be a failure. Other examples range from tagging animals to passports to road tolling, usually very profitably for suppliers. Consumer applications will be a great opportunity for IoT. Unlike industrial IoT implementations it is less about ROI and much more emotional, with consumers prepared to pay for useful products and systems. IDTechEx believe that the business models here are still embryonic and there will be many concepts tried and novelty peaks before strong, sustainable IoT markets emerge. These will usually provide better and new consumer services and propositions - benefits consumers want and are prepared to pay for. The IDTechEx event Internet of Things Applications USA 2014 taking place on November 19-20 in Santa Clara is unique in terms of addressing the applications of IoT - all of consumers, industrial and government based. Hear from end users in different verticals discussing their needs and challenges along with companies monetizing IoT now. For more details see http://www.IDTechEx.com/IoTusa. The new IDTechEx report Internet of Things (IoT): Business Opportunities 2015-2025, is unique in covering both the activities of key players and assessing the business opportunities beyond the hype. Forecasts for IoT smart objects sold 2015-2025 are given, and many actual and potential applications across most sectors are discussed. For more information see www.IDTechEx.com/IoTusa. Are e-textiles on the cusp of rapid growth?